STIEGLITZ. Alfred. The Steerage. Large-format photogravure on Imperial Japon Vellum. Image size 13-1/8” x 10-1/2”; sheet size 18-1/4” x 12-1/2”. Printed 1915. Offered together with the integral double issue (number 7-8) of 291, with which the photogravure was issued. A FINE COPY OF THIS ICONIC IMAGE. 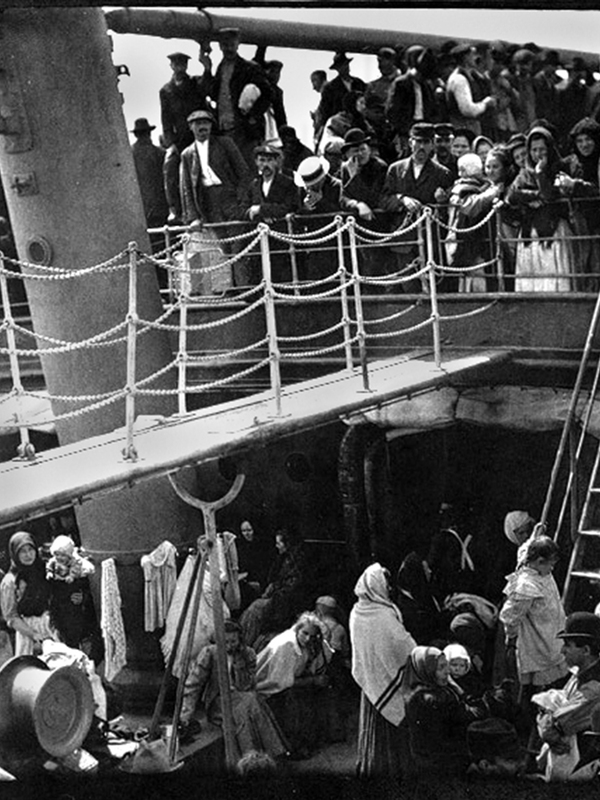 Hailed as “one of the greatest photographs of all time,” The Steerage is both a formative document of its time and one of the first works of artistic modernism. Stieglitz of course was the most prominent early champion of photography as fine art, but The Steerage represents a fundamental shift in Stieglitz’s thinking away from a pictorialist conception of photography. “You may call this a crowd of immigrants,” Stieglitz himself wrote about The Steerage, but “to me it is a study in mathematical lines, in balance, in a pattern of light and shade.” Celebrated for its abstractionist exploration of shape, tone, and texture, The Steerage is deemed one of the first proto-Cubist works of art. Sensing that the scene encaptured “the underlying feeling I had about life,” Stiegliz raced back to his room to get his camera (a hand-held 4 x 5 Auto-Graflex camera that used glass-plate negatives), and fortuitously the scene was unchanged in its fundamentals when he returned. Using the only prepared negative he had ready, Stieglitz snapped the shot. The plate was developed a week later in Paris at a local photographer’s home and kept in its original plate holder for protection until Stieglitz’s return to New York several weeks later. Though Stieglitz later said he immediately recognized this image as “another milestone in photography … a step in my own evolution, a spontaneous discovery,” the photograph in fact languished in his portfolio for almost 3 years until the cubist painter Max Weber came upon it and affirmed its aesthetic importance. (Some biographers say Stieglitz was distracted by the promise of color photography during the interim). The photograph was subsequently published in the October 1911 issue of Camera Work and first exhibited publicly in 1913 at a show of Stieglitz’s photographs at his 291 gallery. In 1915 Stieglitz devoted the entire double issue 7-8 of his art journal 291 to The Steerage, into which large photogravures of the photograph were loosely inlaid and for which Paul Haviland and Marius de Zayas wrote commentary. Copies of the image were produced on both Imperial Japon Vellum and mounted tissue paper. The Steerage is the only photogravure ever to appear in 291.